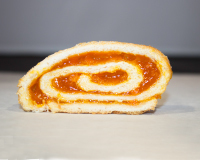 Marie's Apricot Roll starts with our own dough that is gently risen over night in a controlled refrigerated environment. This process yields the most consistent dough possible with the characteristics desirable for a flavorful, light, yet manageable roll. After hand rolling each individual dough, the filling--made from fine California grown apricots--is spread over the entire dough hence full filling from end to end. Then the dough is hand rolled to the log shape for baking in our classic ovens.